Educate parents and teens about the dangers of driving. What Can Parents Do to Keep Teen Drivers Safe on the Road? Parents are one of the most important safety features for teen drivers. Parents can discuss the rules of the road with their teen, including why they are important to follow and consequences for breaking them. They can also create a Parent-Teen Driving Agreement that puts these rules in writing to set clear expectations and limits. CDC's Parents Are the Key campaign helps inform parents about the key role they can—and should—play in protecting their teen drivers. "Parents Are the Key" campaign materials can be used to help parents learn about the most dangerous driving situations for their young driver and how to avoid them. 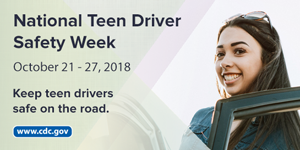 This week and always, keep teen drivers safe on the road! Read the new CDC feature story about keeping teens safe on the road. Visit CDC’s website on Teen Drivers for more information.